In the last tutorial, we used a hook-method to set a default-value for newly created objects (which in this case were groceries). This default-value was hard-coded into the backend code. Now, suppose you want to let every customer who uses your module set this default value from the dashboard without having to download the module-code first and changing it there. That's possible by using so called Configuration Parameter. Datatype: The datatype of the config-Parameter. As we want to set a default-price, we use the Type "Number"
Example: An example for a value. It will be shown in an info-box provided for this config-parameter from the dashboard. Info: An informational text that will be shown alongside the example in the info-box provided by the dashboard. 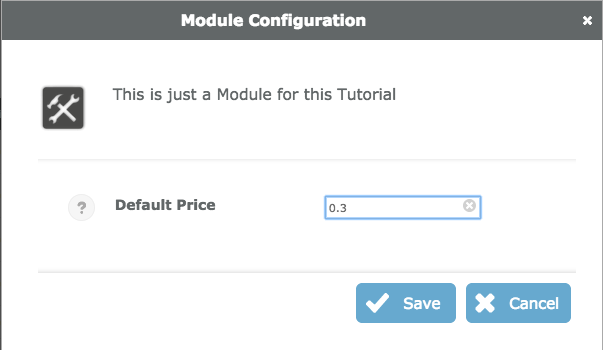 Default-Value: This will be set when the module is deployed for the first time and can be changed afterwards. Order: Set the order in which your Config- Parameters are shown in the case that you have more than one. public static String [IdentifierToCall] = "[ModuleName]_[IdentifierYouLike]". The identifier on the left part is the name by which you will call the default-value from the module-code. The right part is used by ApiOmat for the internal localisation of the default-value. It is important to follow the convention that it must start with the module-name and an underscore. You can customize the part after the underscore as you like. The example below clarifies this expalanation. 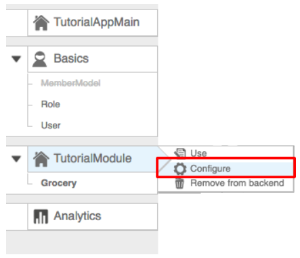 Now that you have set the Config-Parameter, upload your module-code so that your changes are synchronized. Now the Configuration-Panel opens. Set the default-price you like! The problem- Although you provided the option to enter a conifg parameter, you do not use the value anywhere up until this point. Next we will show you how to do this. The value of a config-parameter is called by means of the static method [ModuleName].APP_CONFIG_PROXY.getConfigValue([ModuleName]. [identifierToCall], [applicationName], [usedSystem]). The [applicationName] and the [usedSystem] are provided by the incoming request, and the identifier is the same one you set earlier. The returned value is an object, which has to be type-cast to the acutal datatype you intented to use. Return to the dashboard and go to the data-tab. Now, every time you create a new grocery, it should automatically have the price that has been set in the configuration-dialog! Congratulations! Now that you know how to set configuration parameters, you are well on the way of mastering ApiOmat. In the next tutorial, we will show you how to build rest-endpoints.